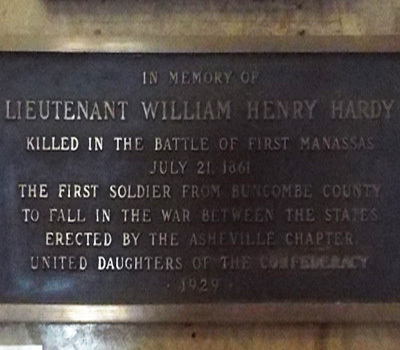 The memorial to Lieutenant Hardy is a simple bronze plaque about 12 inches high by 24 inches wide attached to a wall between several elevators in the lobby of the old historic section of the Buncombe County Courthouse. The presentation address was made by Mrs. A. Matthews on behalf of the Asheville Chapter of the U.D.C. and the plaque unveiled by Miss Harriette Taylor Tennent a grand-niece of Lieutenant Hardy from Spartanburg, S.C. The plaque was accepted on behalf of Asheville by Mayor Gallatin Roberts, on behalf of Buncombe County by Newton M. Anderson and on behalf of the State Division U.D.C. by Mrs. E.L. McKee. The plaque was manufactured in New York City. 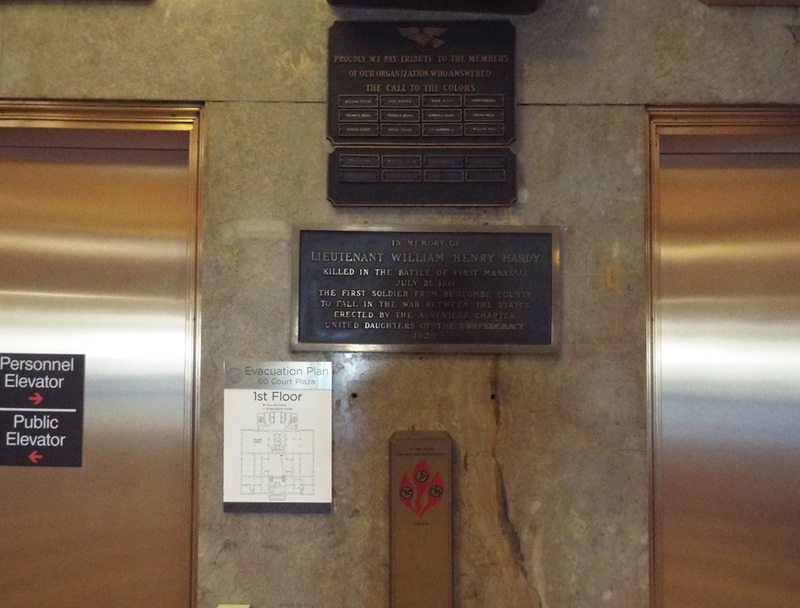 The plaque can be found in the lobby of the old 1927 section of the Buncombe County Courthouse, at College St. and Court Plaza, Asheville, NC. To access this lobby one must enter through the modern entrance facing College Street. On the same wall as Hardy’s plaque is one to Col. Edward Buncombe. In the immediate area of the old Buncombe County Courthouse there are other notable plaques, monuments and memorials: Western North Carolina Veterans Memorial, 60th NC Regiment, Revolutionary War, Spanish American and other wars, Police and Firemen who died in the line of duty, Medal of Honor recipient Lt. Colonel Robert Morgan and former Governor Samuel Ashe for whom Asheville was named. Several hundred yards to the west stands the monument to Zebulon Vance and several other small markers. 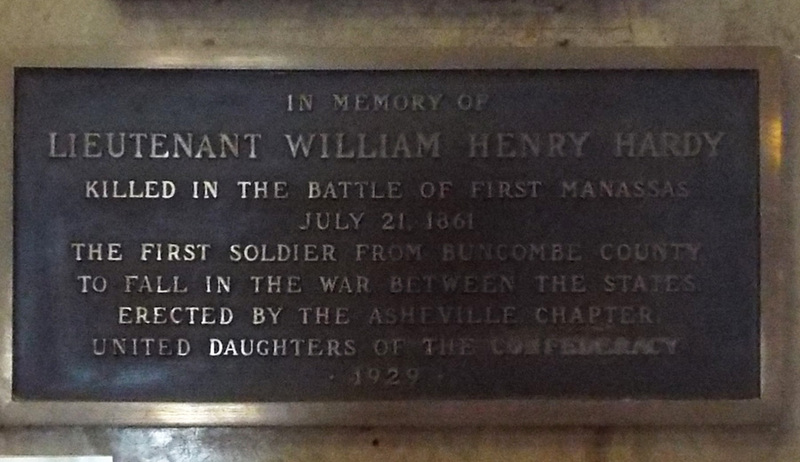 The memorial plaque is in the lobby of the old historic section of the Buncombe County Courthouse.